Another Filipino favorite is this Korean beef dish called beef bulgogi. I think in my opinion this is a Korean version of our very own beef bistek and the cooking is almost the same except the ingredients are very oriental. Sesame seeds, rice wine and sesame oil are common in oriental dishes which are seldom found on Filipino cuisines. But maybe will ask, what makes this a Pinoy version of bulgogi? You guess it right! 7-up and annato seeds! But don’t fear, this beef bulgogi is an easy to cook version and if you can cook beef bistek, then cooking this will be easy for you. 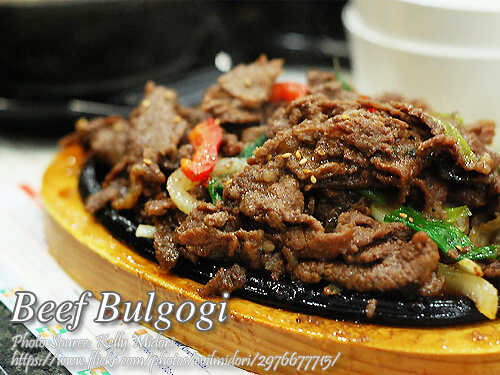 To cook beef bulgogi; Marinate the beef with all marinate ingredients and mix very gently. In a large pan, heat 1 tablespoon of oil and saute garlic and onion until fragrant. In a same pan, set it to medium heat, and another 2 to 3 tablespoon of oil then add beef and fry until brown for at least 10 minutes. Pour marinade sauce and let it simmer and absorb the flavor using low heat about 15 minutes. Once sauce has slightly evaporated, add 1 cup of water and let it simmer in very low heat for another 30 minutes. Pour in soy sauce and vinegar. Let it simmer in low heat and cover pan without stirring for a few minutes. Then add sliced mushrooms, annatto water, dried chili, patis, sugar and salt to taste. Stir cook and continue to simmer until beef is tender enough and sauce is thick. Another Filipino favorite is this Korean beef dish called beef bulgogi. I think in my opinion this is a Korean version of our very own beef bistek and the cooking is almost the same except the ingredients are very oriental. Marinate the beef with all marinate ingredients and mix very gently. Let the ingredients tenderize the beef. Marinate in the refrigerator for at least an hour. Better if you can leave it overnight. In a large pan, heat 1 tablespoon of oil and saute garlic and onion until fragrant. Drain the beef from marinade, and set aside marinade for later use. In a same pan, set it to medium heat, and another 2 to 3 tablespoon of oil then add beef and fry until brown for at least 10 minutes. Pour marinade sauce and let it simmer and absorb the flavor using low heat about 15 minutes. Once sauce has slightly evaporated, add 1 cup of water and let it simmer in very low heat for another 30 minutes. Pour in soy sauce and vinegar. Let it simmer in low heat and cover pan without stirring for a few minutes. Then add sliced mushrooms, annatto water, dried chili, patis, sugar and salt to taste. Stir cook and continue to simmer until beef is tender enough and sauce is thick. Turn off heat and serve with cooked rice. Garnish sliced spring onion if desired. Just what I’m looking for! A Pinoy version of beef bulgogi. Thanks. Hi Gal! you are welcome! I’m an American born Filipina who loves to cook. Your recipes are easy to follow, my new favorite of yours is the Beef Bulgogi. Thanks for helping me explore my Filipino heritage and its delicious cuisine! Hi Belyn, thanks also for the kind words and hoping this blog could help you even more! Cheers! Hello Sir Manny! What sugar did you use? White or Brown? 😀 Thanks! Hi Iyey, you can use white or brown sugar.